After a few weeks of on and off sales and organising unthinkable amounts of amazing stock, Dr What!, the iconic video/DVD store in Bondi Junction, is finally closing down. Dr What Video! has always had the most amazing collection of films and documentaries available for hire. Over the years I have spent many hours perusing the shelves, and chatting to owners Neal, Carol and Daniel Crisford about films and film stuff. I’ve also used their post-production services for various projects. I can’t help feel somewhat sad about the closure of this long-time Bondi Junction business. Dr What has not only played a part in inspiring and educating me on a personal level in terms of my appreciation and love for cinema, documentaries and screen culture, but has also been a great help in my professional work and development. The business first opened in about 1981. Apparently one of the original co-owners was a Mr Watt, thus the idea for the name. But at this time, the business was not a video/DVD store. It was really just selling VCRs. My dad, who was lover of movies, bought our first VCR from Dr What. I guess we would have been classified as “early adopters” of the VCR, since my family was one of the first to have a VCR among people we knew. At this time, c.1982, VCRs were not all that affordable and so weren’t selling as fast as anticipated. So in order to encourage consumers to purchase a VCR, the owners of Dr What figured that by stocking movies that were hireable on video, people might be persuaded to buy a VCR. The strategy worked, but the demand to watch videos became so great that the business shifted direction to become more of a video store than a electronic (VCR) shop. 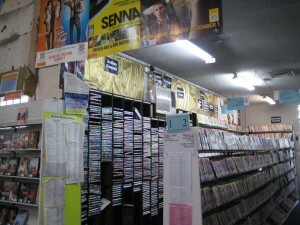 And this is how Dr What started and grew into becoming one of the few video stores in Sydney with an extensive selection of art-house movies and documentary films. The Crisfords became the owners of Dr What in 1983. 31 years later it is the end of an era as they close the video store for good. This is sad for the local community. I for one, am very sorry to see Dr What close down. However, the Crisfords are saying that Dr What will continue to have an online presence and the post production services will still continue. Thanks Dr What, for many years of quality entertainment and inspiration as well as assistance in my professional work.